Concrete Tall Thin Vase | Home & Garden Pottery & Planters | Ships across the US. Tall and stately these garden containers are impressive. With their sharp corners, tapered body and simple design, they will go with all decorating styles. Available in these 3 generous sizes they look wonderful as a group or all by themselves. 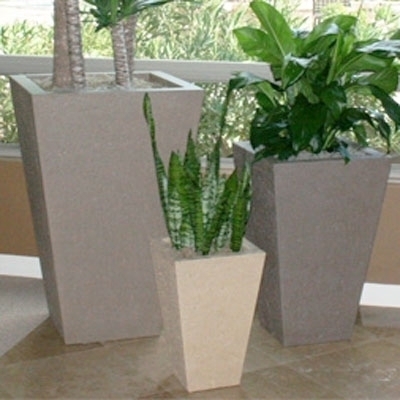 Flank an entryway, fill a patio corner or in a garden area displayed as a piece of art, these planters can do it all.